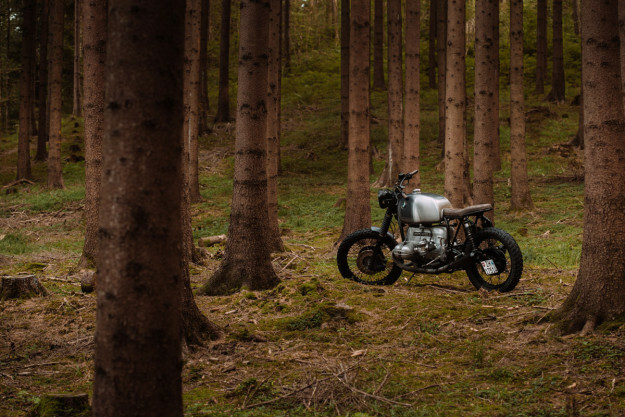 In the small Swiss village of Bonstetten, near Zürich, Ramon Seiler restores classic cars and motorcycles. 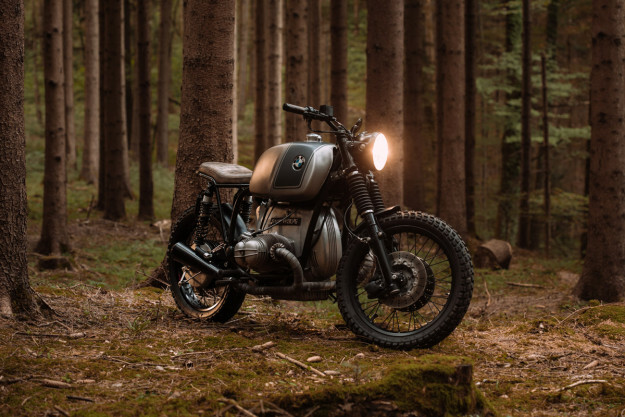 But when he got his hands on a BMW R90/6, he decided to break character—and build his first custom. Despite being parked up for twenty years, the donor was in pretty good nick. 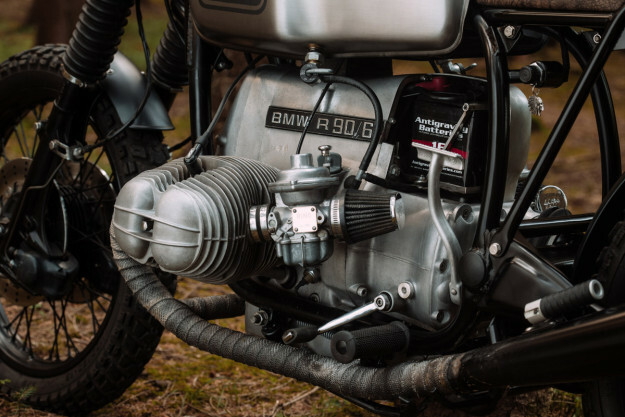 So once Ramon got the engine running like clockwork, he turned his attention to a rather unusual mod: putting the battery into the air filter box. No aftermarket parts are available to do that, so Ramon used the original air filter as a model and fabricated a new battery cover from 2mm aluminum sheeting. Inside, he added a hand-made stainless steel bracket to hold a small Antigravity battery. With that ticked off, he moved onto the rest of the bike. 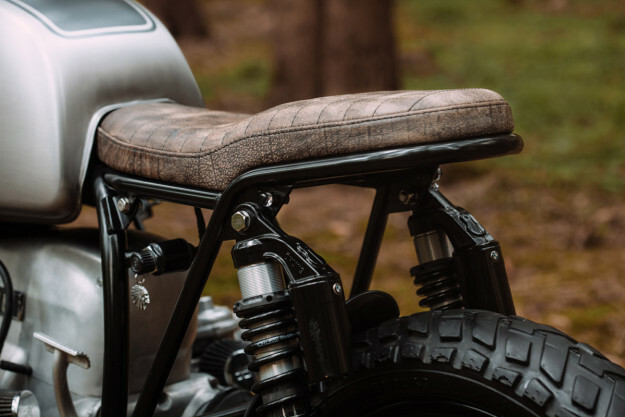 There’s a new subframe to support the custom-made seat, which has been upholstered in cow leather by a local artisan. 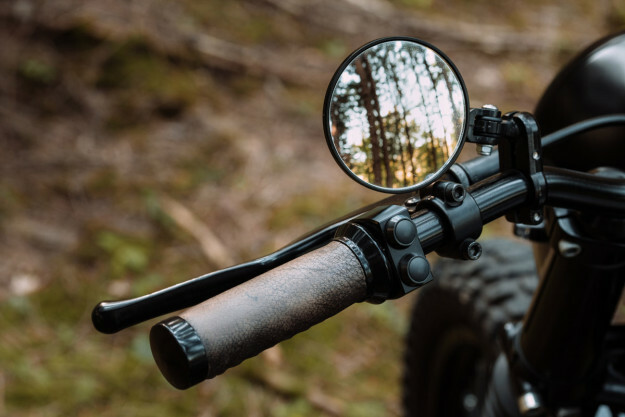 Though the main frame has been de-tabbed, Ramon has made the subframe a bolt-on affair—just in case he needs to return the bike to stock, to meet Switzerland’s strict regulations. A neat little under-seat ignition mount was added in the process. And—to keep the rear as clutter-free as possible—there’s a side-mounted tail light-slash-plate bracket. Just above it are passenger pegs from Tarozzi. Ramon is clearly a stickler for detail, and was set on matching the R90’s grips to its new saddle. A set of Vespa grips seemed suitable, and little lathe work helped them to fit. They’re now wrapped in the same leather as the seat, and topped off with painted end caps. 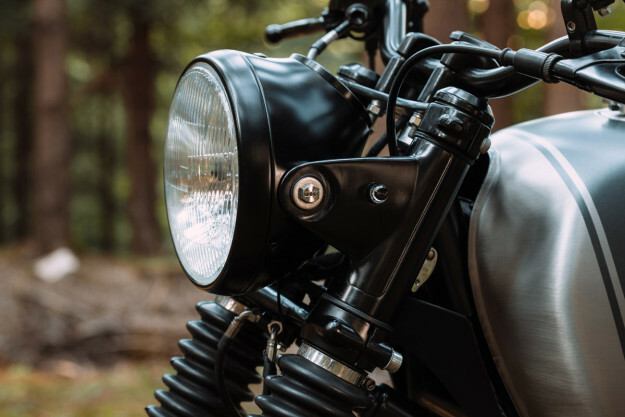 The recessed headlight is from the Wrenchmonkees’ online store, and modified to house a Motogadget speedo. Ramon tweaked the cockpit still further with new handlebars, Motogadget switches and a Tommaselli throttle. He’s upgraded the brakes too, with a Brembo master cylinder plus steel lines and new discs from Spiegler. 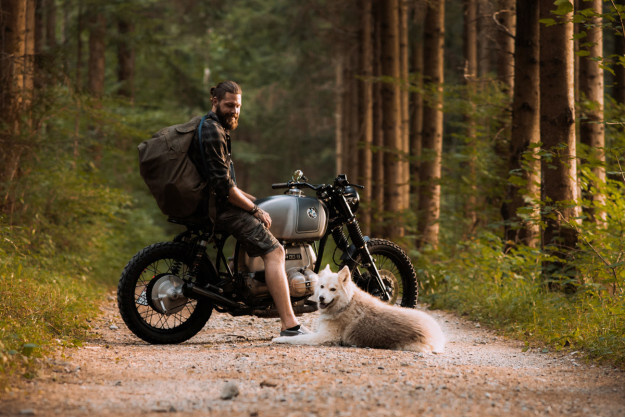 A pair of Hattech Gunball mufflers improve the soundtrack from the boxer engine. The front forks are lowered just over two inches, and improved with Wilbers springs. A set of Öhlins shocks do duty out back—painted black to match the rest of the bike. The tires are Heidenau’s K60 dual-sport pattern, and hand-made aluminum fenders keep the muck at bay at both ends. Less conspicuous details include a Motogadget m-Unit control box with a new wiring harness, and minute m-Blaze turn signals. Ramon’s also added new badges and a top triple clamp from Bayer—which he’s re-machined for a better visual match with the existing lower clamp. 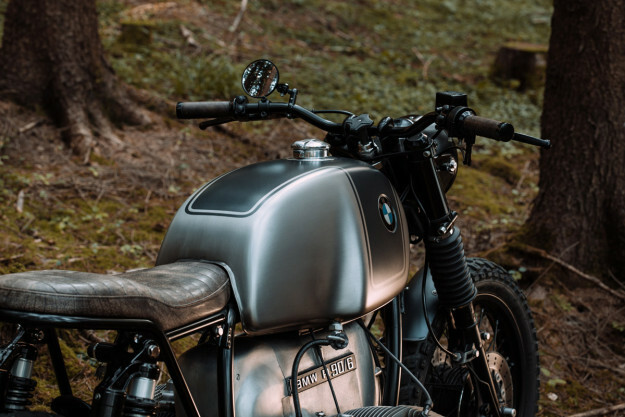 All the fasteners were upgraded to stainless steel items, with the Kontrast Kreations logo laser-etched into the headlight and rear shock bolt heads. 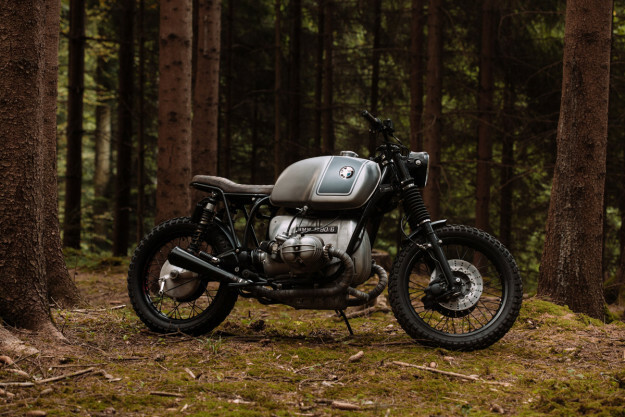 Tying everything together is the fuel tank—borrowed from another BMW R, but this time a slash-7. Ramon painstakingly sanded it down and sprayed it with the Chevrolet Corvette color Cyber Grey, before clear-coating everything. 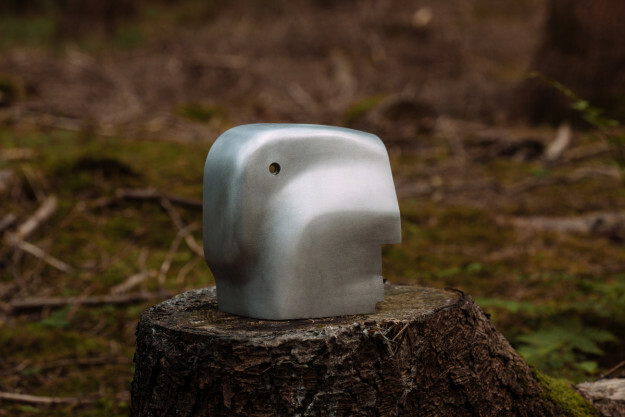 And then—when he saw it in sunlight and noticed a few unsavory sanding marks—he stripped it down and repeated the process until perfection was achieved. 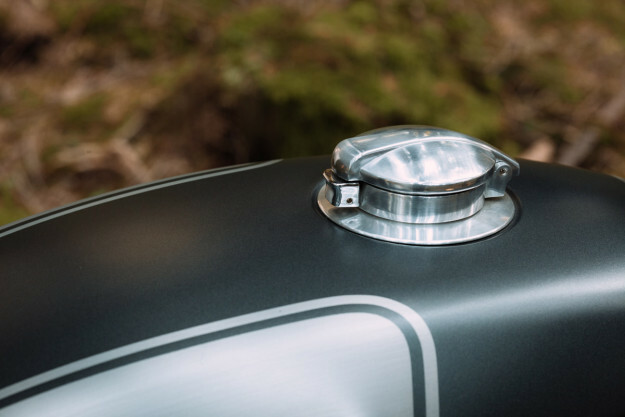 An aluminum filler cap from Huggett adds a finishing touch. 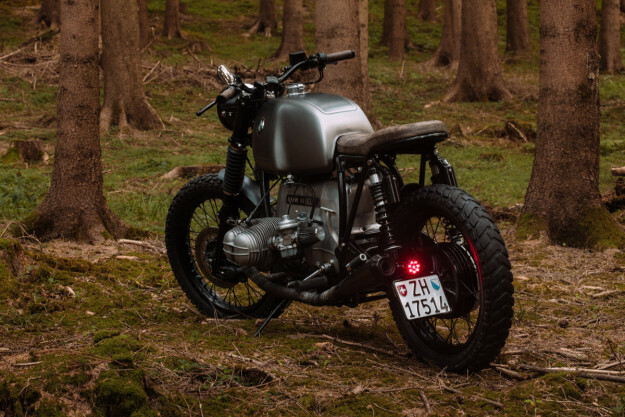 Ramon’s BMW R is simply Wunderschön—the perfect city-to-woods runabout. And proof that those fine traditions of Swiss craftsmanship and intricate metalwork are alive and well.